Artifact: n.i. an object made or modified by hand. Variation of artefact - latin phrase artefactum - something made with skill. 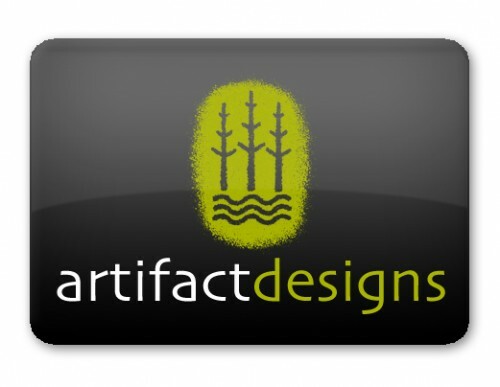 Artifact is the name of a series of designs that are handcrafted with polymer clay by Jim Traversy. Polymer clay is a versatile, coloured, low fire, synthetic modelling material that is very durable. Many people know it as Fimo or Sculpey the most popular brands of polymer clay. The main technique used in these designs is called millefiore or canework. Canework or millefiore is an adaption of centuries old methods used by artisans to make glass beads. Initially, the designs are carefully built in the form of logs, known as canes. The canes can be reduced in size by a process of stretching and squeezing by hand. After reducing, the canes are sliced into individual pieces that each display a cross section of the design. These are baked and made into brooches, earrings, necklaces and other items. 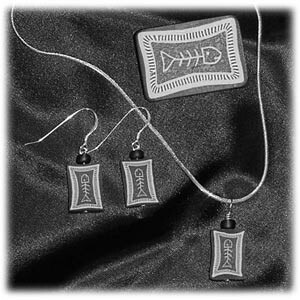 The Fish Bone design on the right was created using this canework technique. Jim has created a series of canes using his original pictograph imagery created in his studio located on Mayne Island BC. The symbol imagery reflect and express some of the aspects of life on a small rural island off the BC coast. The photos on the right show a few of the canework designs that Jim has created, which are available as pendants and earrings. 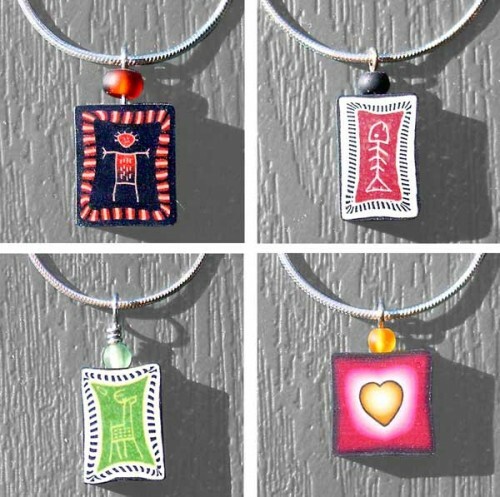 Pendants with sterling silver chains are $27.95 (Canadian funds) and with waxed polyester slip-knot cords are $15.95. Earrings with sterling silver shepherd hooks are $24. Jim's work can be seen at various craft shows on Mayne Island and at his display in the Granville Island Public Market in Vancouver. Check www.gidva.org/artifact to see when Jim is booked at Granville Island. You can see other great examples of artisans who are pushing the limits of polymer clay craft at the web log Polymer Clay Daily http://polymerclaydaily.com. The brooch on the right was made using a technique known as micro-mosaic. 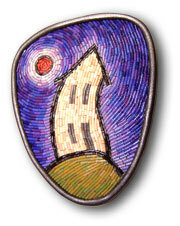 The image is a small mosaic made from tiny pieces of polymer clay laid in bit by bit under magnification. It is 6.1 by 4.7 centimetres. The brooch took approximately a week to create.